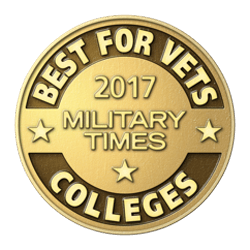 November 18, 2016 – Cypress, CA – Trident University International (Trident) is proud to announce that it has been selected as part of the “Best for Vets: Colleges 2017” rankings by Military Times. The eighth annual rankings factor in the results of Military Times’ comprehensive school-by-school survey of veteran and military student offerings and rates of academic achievement. This is the second consecutive year that Trident has been selected for this prestigious recognition. Trident placed at #14 on the online & nontraditional schools list. This was driven by the university’s commitment to supporting student success, especially that of military and veteran populations. In addition, Trident has continued to expand the Trident Military Assistance Center (TMAC). The center provides for transitioning service members through financial planning assistance, transition events, resources for health and wellness, career guidance, and more. “At Trident, we remain focused on improving the student experience for the men and women who have served our country. We’re proud of this acknowledgement because it means that we’re on the right track,” said Travis Allen, Trident’s President & CEO. As with all Best for Vets rankings, Best for Vets: Colleges 2017 is an editorially independent news project that evaluates the many factors that help make colleges and universities a good fit for service members, military veterans, and their families. More than 500 colleges took part in this year’s detailed survey. “We limit our list to encourage competition, and we genuinely hope this helps raise the bar for veterans on campus,” said Amanda Miller, editor of Best for Vets. Military Times’ annual Best for Vets: Colleges survey asks colleges and universities to meticulously document a tremendous array of services, special rules, accommodations, and financial incentives offered to students with military ties; and to describe many aspects of veteran culture on a campus. These institutions were evaluated in several categories, with university culture and academic outcomes bearing the most weight. Military Times also factors in data from the Veterans Affairs and Defense departments, as well as three Education Department sources: the IPEDS Data Center, College Scorecard data, and the Cohort Default Rate Database. For the full Best for Vets: Colleges 2017 rankings, and survey methodology, go to: www.militarytimes.com/bestforvets-colleges2017. The rankings will be published online at MilitaryTimes.com, as well as ArmyTimes.com, NavyTimes.com, AirForceTimes.com and MarineCorpsTimes.com as of Nov. 1; and will appear in full in a special magazine issue of Military Times on newsstands in mid-November. The release of this year’s list also marks Military Times’ inaugural declaration of the month of November as Veterans Month. The independently owned media company is celebrating veterans beyond Veterans Day, with 30 days of veteran-focused coverage. Military Times’ Best for Vets rankings include Colleges, Career & Technical Colleges, Business Schools, Franchises, Employers, Law Enforcement and Places to Live.